Happy Harriet Carter Wednesday! I’m still trying to make it into the Harriet Carter Crapalog, but nothing to report yet. This week Harriet covers some food, a horse, and an old lady. Pervert. Let’s go! Product # 1 – Do your kids ever yell to you, “Hey Mom? 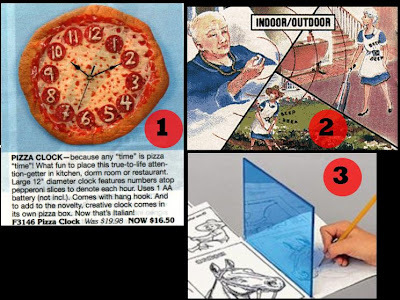 What disgusting time is it?” You, of course yell back, “I don’t know, what does the gross pizza clock say?” Seriously? A pizza clock? Why? Why are they bragging that it’s so life like? It even says “Now that’s Italian!” Really Harriet? Really? That’s racist you whore. Pizza isn’t even Italian. Why don’t you just say that clock is in the Mafia? You better “watch” your back. Pun intended, douche bag. The pepperoni isn’t even lined up correctly? The 6 is kinda where the 7 is. Nice job confusing your kids, just for a laugh. Why would people think this is funny? I’d be embarrassed for whoever owned this. I mean, this may be “all the rage” at the trailer park, but in the rest of the world you just look like an idiot. Now eat it Harriet. Eat it! Product # 2 – Is your elderly spouse a real “downer?” Is your “fun time” having to do all the house chores ruined by your elderly spouse screaming or ringing the bell? Well, if the duct-tape over the mouth didn’t work and breaking the bell didn’t stop them, maybe you should try this high-pitched alert alarm! Once pressed you can even hear it while your doing all of “his” yard work. Sure it’s so loud that you’re going to think that someone has declared jihad on your house and you’ll, of course, raise your own “terror alert” level to red, but at least you’ll be at his beckon call. Wouldn’t it just be easier to strap this person to your back? Or at least tie a rope around their belt and just drag them around the house. Product # 3 – Do you ever feel like your kids are too original? Horrifying, I know! One easy way to stunt their creativity and originality is to buy them Harriet Carter’s “tracing tool” which I believe actually just consists of a piece of plastic that reflects. Awesome. Don’t encourage your kids to draw the horse they want, just tell them to trace a horse that’s already there! Why waste time with your imagination? Someone has probably already thought up something you’ll eventually think up, so just take the easy way out and copy other people! Thanks Harriet Carter for trying to slowly turn our youth back into a Nazi society. See you in hell, Hitler.